Here’s the text of a letter I wrote my Senator, Bob Menendez, on Donald Trump’s missile strikes on Syria a few weeks ago. His “response” follows. Obviously, it isn’t really a response, and isn’t really meant as one. I’m just curious what it takes to get a straight answer from our politicians on matters of war and peace. Famous last words, I realize. I’m interested in understanding your position on American military involvement in Syria. The last item on your website to make reference to Syria is an interview with CNN’s Wolf Blitzer’s dated April 10th, just before President Trump’s missile strikes on Syria. Your segment comes after a brief and rather uninformative interview with Senator Bob Corker, but it raises more questions in my mind than it answers. “Well, Wolf, the problem here is that a military action in and of itself isn’t a strategy as it relates to Syria. It’s a one-off. We saw the President take a strike when Assad used chemical weapons previously. It did ot achieve the ultimate goal: the end of the use of chemical weapons by Syria against Assad’s own people. Your criticism of President Trump’s policy is that he favors less military involvement than you. He wants to strike Syria in a sporadic, ad hoc fashion while withdrawing (or claiming to withdraw) ground troops. It’s not entirely clear what you mean by a “comprehensive strategy,” but whatever the details, you seem to favor increased military involvement: more strikes and greater troop involvement. The rationale you give for greater involvement in Syria involves four elements: stopping the use of chemical weapons, defeating ISIS, resolving the civil war, and responding to humanitarian concerns. It’s obvious that a four-fold strategy needs a five-fold justification: a justification for each element of the strategy, plus a justification for combining the four elements into a single comprehensive strategy. If you favor such a strategy, you owe your constituents such a justification: you can’t criticize the President for lacking a strategy of the kind you think we ought to have when you are the one recommending increased engagement and he is recommending (or claiming to recommend) less. It’s the advocate of increased military engagement who more obviously bears the burden of proof for devising a justification (and by implication, strategy) for engagement, not the person advocating less. That’s not to absolve the President of responsibility for devising a justification/strategy of some kind, but to insist that the responsibility is, by your own words, heavier in your case than his. It makes no sense to insist that President Trump devise a comprehensive strategy for military intervention in Syria if he is sincerely in favor of withdrawing from Syria. Of course, if he isn’t sincerely in favor of withdrawing, the problem is with his insincerity, not his failure to devise a comprehensive military strategy. But since you sincerely wish to intervene, you owe us more of an account of why than a few “if” clauses offered as preface to criticisms of the President. “For the most part, people making decisions about our wars don’t have skin in the game,” said Sherrill. “Their children don’t serve; their friends’ children don’t serve. They don’t have a sense of what combat means. We have to make sure we’re not sending people off to be killed for improper missions.” (Mark DiIonno, “Veterans bring ‘country first’ mentality to politics,” Star-Ledger, April 22, 2018). Ms. Sherrill has, in my view, understated the point, and put it a bit too diplomatically. Whether they have skin in the game or not, the people making decisions about our wars have not—for decades—bothered to justify the decisions they’ve made, to the American people or anyone else. They not only have no sense of what combat means, but no sense of what rational justification requires. They have simply assumed without argument that we agree with their decisions, whatever they may be, and proceeded to start wars on the basis of “goals” that they presume we all share. To put the matter bluntly, I don’t agree with a single one of the goals you’ve taken for granted with respect to our involvement in Syria, much less with the need to combine them into a single super-goal requiring a “comprehensive” military strategy. There’s no need to speak in euphemisms on this topic: a “comprehensive” military strategy is a plan for a full-scale war. Before we have another war, we need to be given absolute certainty that such a war is justified and necessary. We’ve been given nothing of the sort. We’re owed at least that much. Thank you for contacting me to express your concerns regarding the conflict in Syria and the response of the United States to President Assad’s use of chemical weapons in violation of international law. Your opinion is very important to me, and I appreciate the opportunity to respond to you on this important issue. The Assad regime and its backers must be held accountable for the use of chemical weapons. The President’s announcement of airstrikes in cooperation with the British and French military underscores the importance of partners and alliances in achieving shared objectives. But we should be clear: military strikes are no substitute for a real strategy. While we are still learning the details about these strikes, the Administration has not provided sufficient details about its military plans. The President has asserted authority under Article II of the Constitution for these strikes, but any sustained military action in Syria would require Congressional authorization. I expect the Trump Administration to promptly brief Congress on these strikes, their plan for Syria, including countering Russian and Iranian support for the regime, and any future use of military force. As someone who voted against the war in Iraq when I was a member of the House of Representatives, I share your concerns about committing the errors of the past, including committing U.S. ground forces to open-ended conflicts abroad. Under current circumstances, I would not support the deployment of a large contingent of American combat forces to the region. As Ranking Member of the Senate Foreign Relations Committee, I also look forward to a thorough debate of the new Authorization of Use of Military Force introduced in the Senate this month. Again, thank you for sharing your thoughts with me. I will continue to monitor the situation very closely, keeping your views in mind. Please do not hesitate to contact me if I may be of additional assistance. 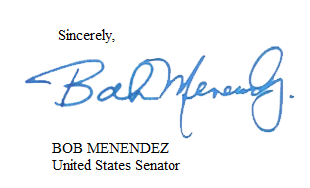 I also invite you to visit my website (http://menendez.senate.gov) to learn more about how I am standing up for New Jersey families in the United States Senate. The whole argument turns on the claim that the “Assad regime and its backers must be held accountable for the use of chemical weapons.” Next round question: why? He seems to assume that a “comprehensive strategy” designed to stop Assad from acquiring chemical weapons can be achieved without a troop deployment. But we introduced troops into Iraq precisely because air power was insufficient to ensure Iraq’s being “held accountable for” its weapons of mass destruction. Next round question: why think that Syria is any different? At some point, I’d like to think, this regress ends with an answer.